This sunlight shot shows how 3 coats on my thumb was not a good look! Have you tried any textured polishes yet? What do you think? 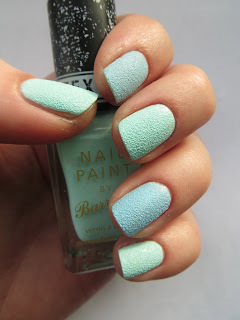 Do you like the Barry M ones? It's funny, I noticed the three coats going funny too, you don't expect that! I like the blue and green together there, they look really pretty next to each other. Thank you! The colours didn't come out completely accurately on my camera, but they're good enough I think...!